Do you remember this kitchen featured in Canadian House and Home? It has been my favourite for years! Who knew it was Tommy Smythe's kitchen? - which makes perfect sense as I have become a fan of him on Sarah's House. His humour is what I look forward to along with his design aesthetic. Come on HGTV...when is Tommy going to have his own show???? 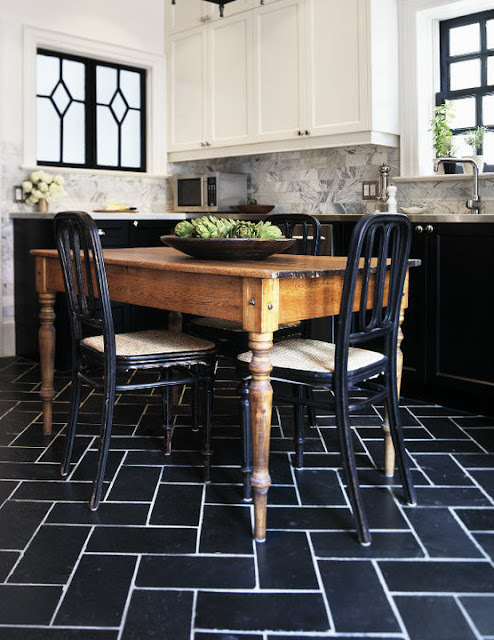 The black tiled floor with the grey marble subway tile backsplash is where this wonderful kitchen begins for me. Not sure I would do a stainless counter, but it looks fab! I also like plenty of clean wooden spoons by my stove. Next, the black lower cabinets and the white uppers is a great way to anchor the room, yet lighten and balance it with the white. Tommy, didn't you say you hated the bow and arrow fridge handles??? 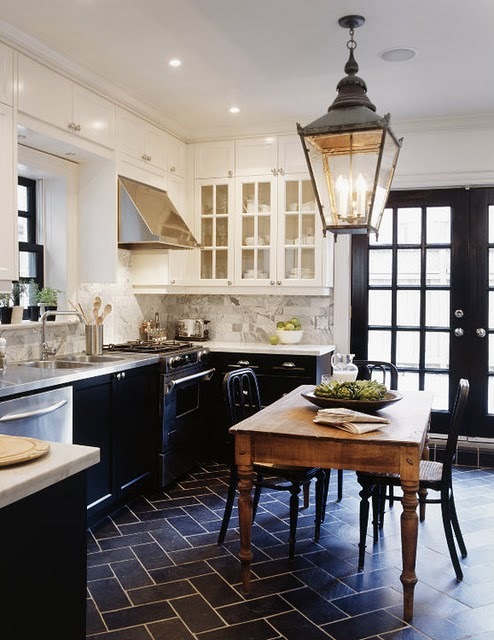 I love the French feeling this kitchen gives you - the bentwood/rattan cafe chairs with small, honeyed pine table, french black doors and a huge lantern light. Remember this spread for Canadian House & Home of Tommy's bedroom? - above and below all photographed by Michael Graydon. 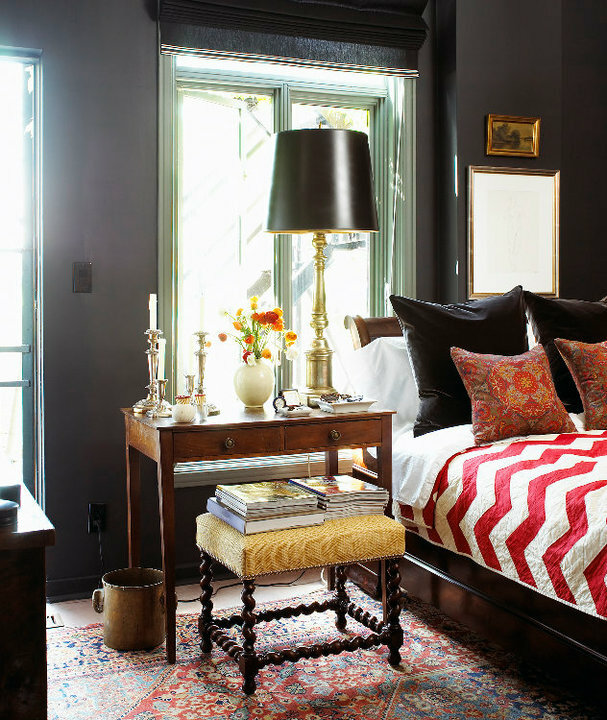 Love the black velvet cushions and I am always a sucker for persian rugs. 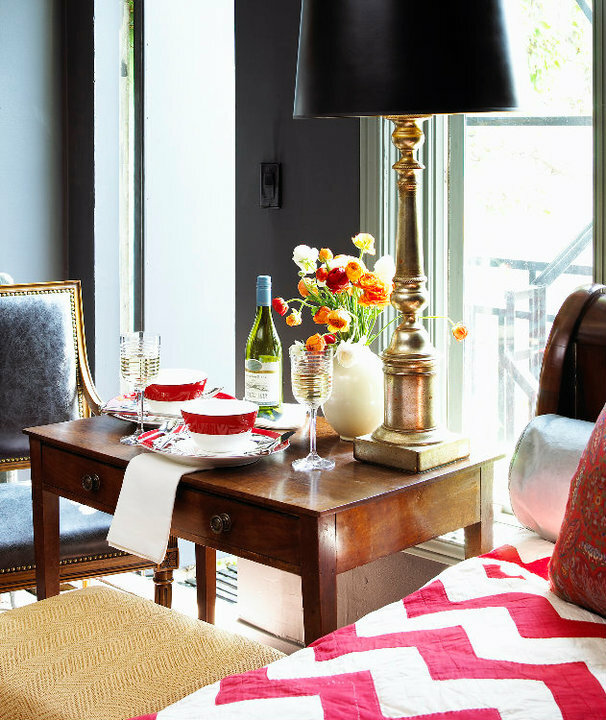 As an avid reader, I also admire the idea of placing a huge lamp on the bedside table. Oh - and there's the another one - my guess is it's the same one - but a beautiful vignette nonetheless. Very classic like Ralph Lauren and Thomas O'Brien, yet Tommy has a style very much his own. 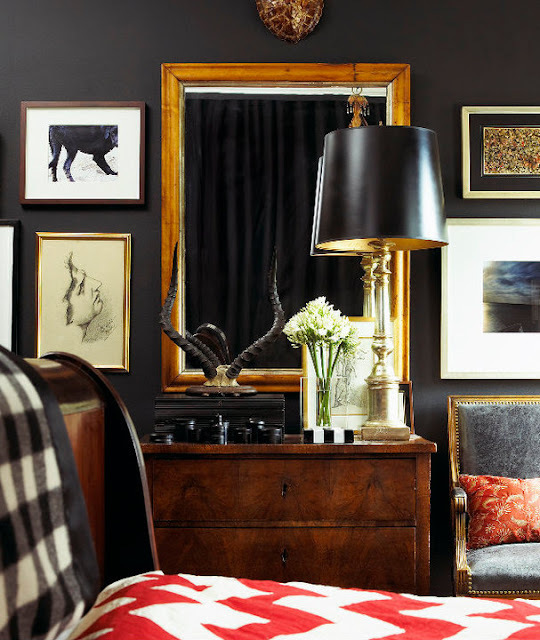 I love the whack of red stripes in this otherwise traditional space. Congrats Tommy, on your success and I look forward to seeing more Tommy Smythe Designs! Me too. Slate or I think it could be just plain old black tile on the floor. If they don't have the half cut size, the tiler can just cut one in half. Good luck on your kitchen. Also, you could leave Tommy a message asking him on Facebook. Let me know if you find out! I absolutely love this kitchen. Especially the over sized light fixture. But, I have one question.... Does Tommy actually cook? I adore Tommy & Sarah on HGTV! Tommy is talented and very funny. I buddy Awesome combinations of kitchen and great ideas.. I really like the grey subway tile. 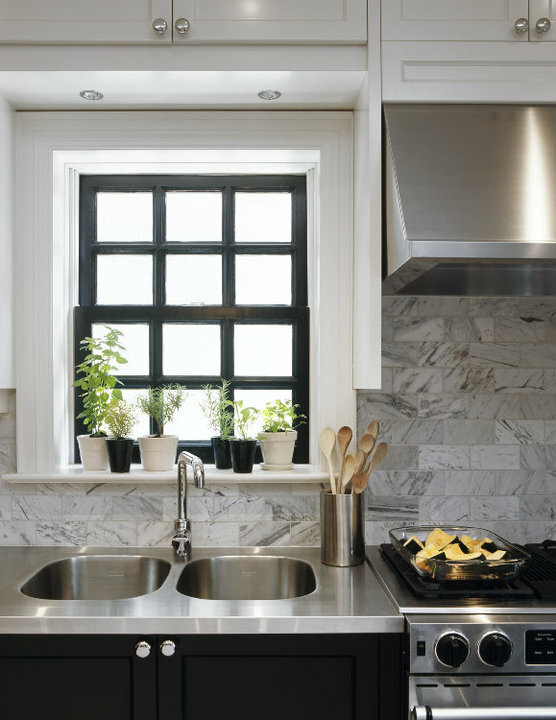 I was looking for alternatives to the white subway tile you see everywhere. We are renovating our kitchen so I need fresh ideas, can always count on Tommy! Also love the little desk area with the cookbooks. Thanks for sharing. The whole look is awesome ... wish I had this talent..
Don't be shy! Please join! I live just outside a big city, but lucky enough to live among the trees (not nearly enough of them in cities!) with my hubby and two girls and Cosmo, our dog. All my life, I have enjoyed renovating and decorating homes (with hubby and construction genius, Lou). 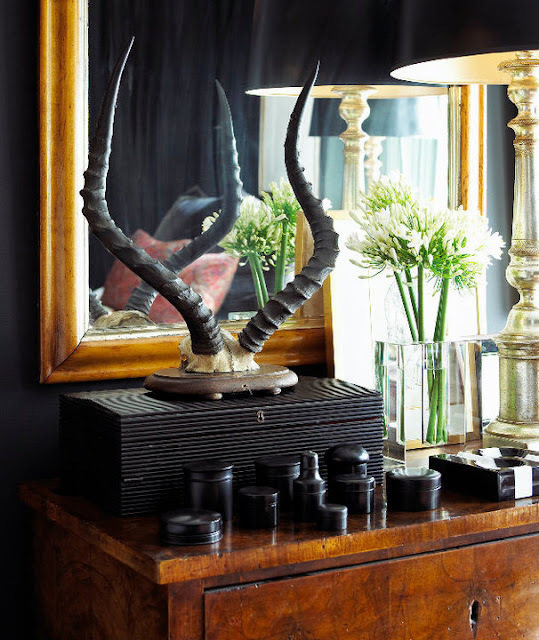 Design being the driving force; the aesthetically beautifully, my eye candy. We have built our home and renovated all previous ones and here is where I collected inspiration to design them. Other fav things are days spent reading, writing, writing, writing and knitting.